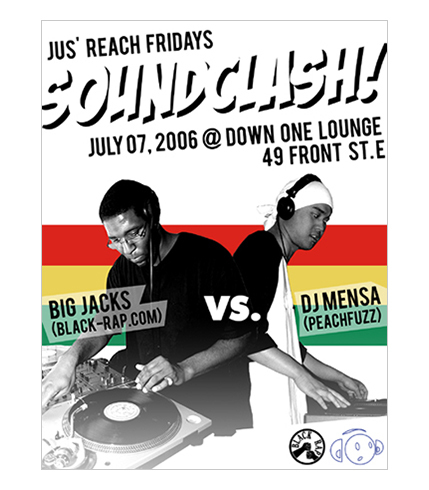 A promotional flyer for Jus Reach's 'Soundclash' event. The design of this flyer was a modern approach to older Soundclash posters that you would find posted up decades ago. A Soundclash is a musical competition where opposing crew members duke it out on turntables to determine who can win over their audience with not only the selection of music they play, but also their sound system as well. We kept it simple with the flyer predominately being black & white, while throwing in the traditional colors of red, gold and green to make it pop.